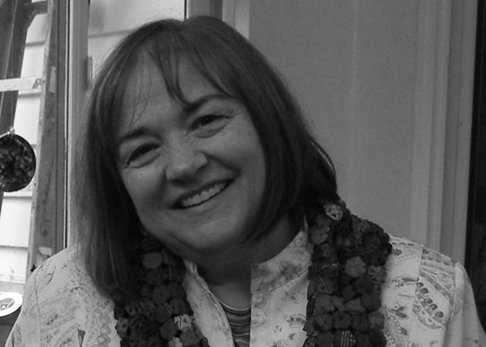 Hi I’m Pat Sloan, the Aurifil Designer of the Month coordinator. I’d like to introduce you to our June Aurifil Designer, the adorable and super talented Annie Smith! I am delighted to share Annie’s work with you. Her love of color creates spectacular results in her quilts. Her “Rose Ring” project is beautiful and she has a unique way of using it, in a frame! 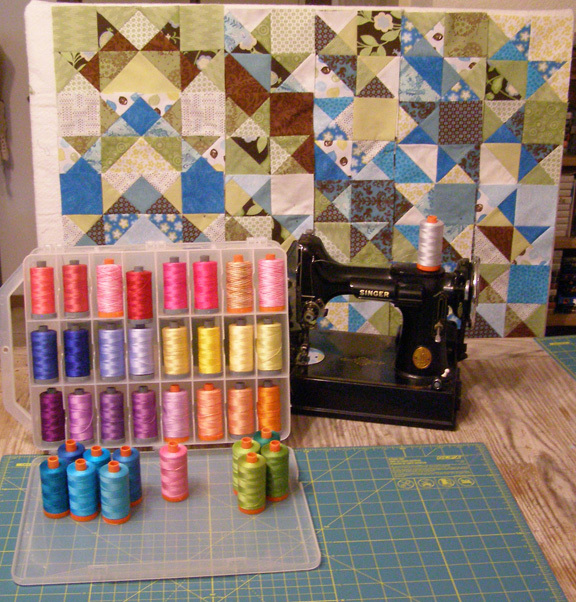 Post your photo at our Flickr folder and one quilter will win a prize of Aurifil thread! Post a photo of your completed top or a project. Everyone in the flickr folder is in the running! My first Quilt sighting was a two-fer: a gorgeous applique quilt on a frame in my future sister-in-law’s house. She belonged to a church quilt group where they made one a quilt a month, designed by one of the members and they all took turns. At the end, the all went out to dinner with their husbands and picked the winner from the group of members. The simultaneous sighting was looking in my future- mother-in-law’s Family Circle magazines to see the quilt kits they were selling in each issue. I remember a brown and rust log cabin quilt that was selling for $39.95 that I wanted to buy. FSIL said, “oh, that’s easy – I can teach you how to make that”, so I didn’t buy it. Instead, I chose my own fabrics (1980 calico and solids, cotton/poly blends) and made a sampler baby quilt out of the book, “Let’s Make a Patchwork Quilt”, all on my own, by hand. 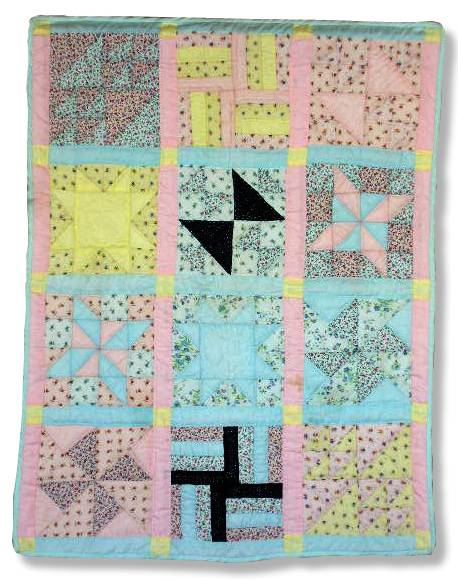 I love sampler quilts – I love to make them and I love to teach them. 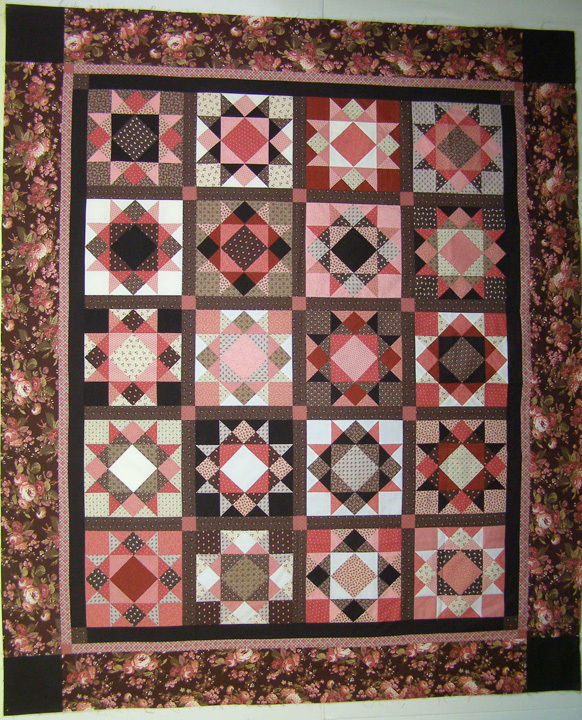 They are the ultimate instructional quilt, with each of the different block patterns teaching a new technique of construction. And they never get boring. Of course, I love putting applique in the samplers too. The “work”. Cutting, measuring, cutting, stitching, pressing, cutting and restitching – all the way to the finished quilt top. I get into the “zen” of the quilt and feel the whole process of creating such a beautiful piece of art. Like growing a child in your body and giving birth to another human being. The creative process is also the working part of the project and I just love the work. I’ve always been crafty and began sewing garments in high school, for fun and profit. I made my prom dresses and had a business sewing vacation clothing for my friends moms. Embroidered boyfriends chambray shirts, knitted shawls, crossstitch, made dolls, took every art class I was allowed in high school. Then, while quilting, I took up knitting again and was a serious knitter. I would knit one year and did no quilting, then the next year would be a quilting year with no knitting. By the time the 1988 Olympics came around, I hung up my knitting needles in favor of quilting because I was tired of not quilting – my true love. I’ve recently taken up knitting and crossstitch again – because, as a professional quilter in the industry, you simply cannot work ALL DAY LONG and all night long. I need a break so I can relax. So, I do handwork in the evening and force myself to watch a few tv programs that I have allowed myself to get addicted to – just so I have an excuse to sit down and get away from the most recent quilt project. 5.Did you have a career prior to making art, and what was it? Do you still do that career while having your design business? If you’ve always done art, did you do another type before quilt making? I was a stay-at-home mom until my kids went to kindergarten, then I worked fulltime in Silicon Valley, doing HR, training and customer service for computers and designing phone systems. I was there for 20 years. During those years, I taught quilting classes in the evening after working all day. I began teaching in 1984. Being a professional in high-tech, it afforded me career enrichment classes in effective presentations, customer service excellence practices, time management and classes of that nature, that I gleaned wonderful skills from that helped me to become a better quilting teacher. I was “there” the day that Netscape turned on the World Wide Web (not invented by Al Gore!). I worked for them then and little did we understand the significance of the instant internet connection like we do now, and all of the accessibility it brings to our lives. There was no such thing as podcasts, blogs or online classes YET – but all of those things that I so very much love now. Spending time with my family: my husband, WebGuy – who does everything for my business that I cannot do, my children – who all support me with my business and share me with students, teaching gigs and listeners alike. My ultimate day would be to have all of my family together for a beautiful family dinner – Italian style, of course – and just enjoy each other’s company. That literally is Heaven on Earth. We’re getting a new addition to our family in November and our little family is growing. I can’t wait to have us all together! 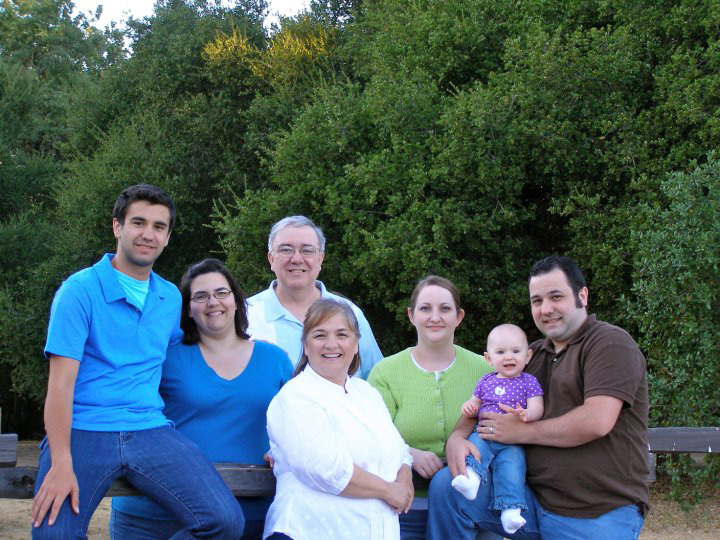 Of course, I’ll have to wait until January of 2012 to do that, as our youngest son is serving a mission for our church in Cuernavaca, Mexico and we won’t see him again until then — but we’re looking forward to that day! Yes! My ritual is cleaning my work area: putting away all of the previous projects, assembling my notions (like laying out a surgical tray with all of the instruments) and fabrics, having a clean design wall and a new audiobook to listen to while I work. I always have an idea stored, as I keep inspiration books, photos on my iPad and sketches in journal that I keep for that very purpose. I begin with the inspirational piece, then choose the fabrics and colors and create as I go. I very rarely have the whole piece in my mind, but rather, work as the quilt tells me what it wants. I also find that if I create what pleases me then everyone will love it. In the past, when I have tried to create something to please someone else ( like a sponsor), I am not pleased with the outcome and neither is the client. So – I create to please myself first and everyone else is happy – because I’ve done my very best work. 28 weight and then 50 weight. I use the 28 weight exclusively for my machine applique stitching and free-motion embroidery and then I use the 50 weight for piecing blocks, quilt tops and backs and machine quilting. The 28 weight is absolutely lustrous and makes my machine applique “stand up” and become almost three-dimensional. The 50 weight is the BEST for piecing. To give you an example, I kept track of how far one large spool of 50 weight #2310 neutral would go: FIVE pieced quilt TOPS and their BACKS before I ran out of thread. That is astronomical! My “go to” colors? Magenta, Orange, Green, Turquoise and Purple with a touch of yellow, on Black. Anything you put on Black becomes electric. 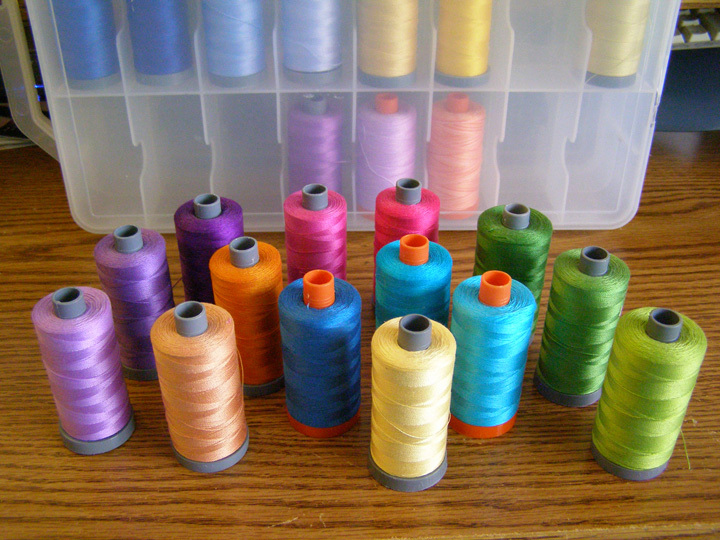 Aurifil thread (and that began many years ago, before I became an Aurifil designer), Clover Fork pins, SoftFuse fusible web, great little scissors, rotary cutter, several Bobbin Savers with my stash of wound bobbins, a digital camera (for instant feedback) and a design wall. 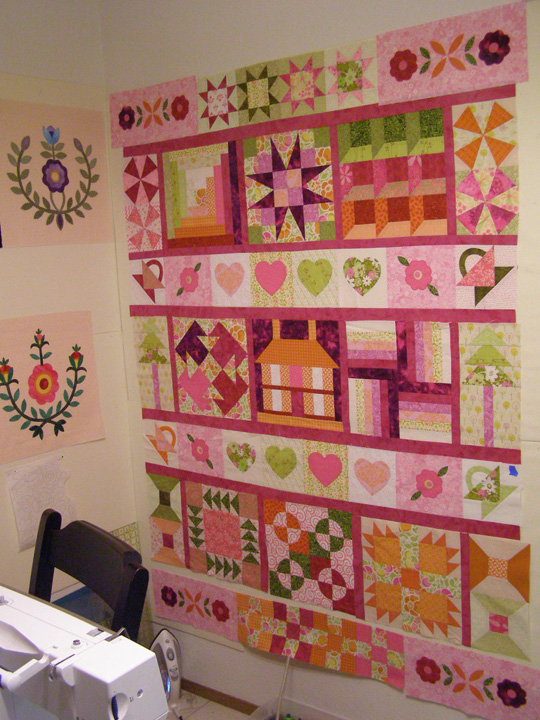 I have NO idea how any quilter quilts without a design wall! I do travel to teach at least once a month, sometimes more, sometimes less. Guilds, shops and I do my own retreats. 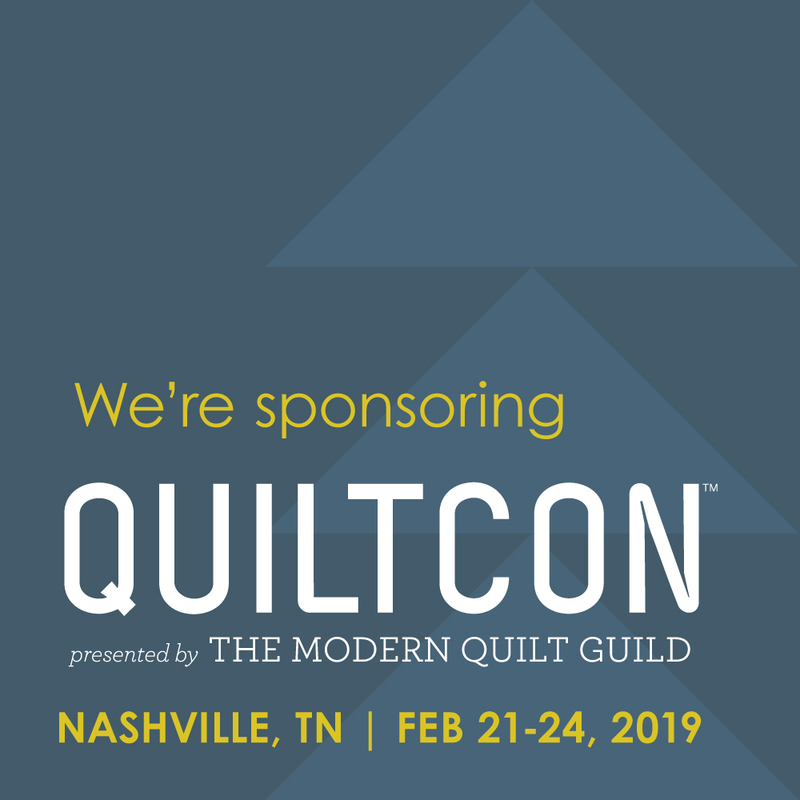 I will teach at the Smoky Mountain Quiltfest in March 2012, Mexico and Costa Rica after that, and have taught outside of the U.S. I do keep a schedule on my website, as well as what I teach and lecture subjects. 12.How would you describe your personality? Are you process oriented, detailed, big picture, are you carefree, structured, unstructured, all over the place depending on the project? My personality is happy and adaptable. I have never been shy one day in my life – I was the girl who always asked the boys to dance, so you could say that I am impatient waiting for things to happen, so I’m pretty much a facilitator too. Like starting the first podcast for quilters – I couldn’t wait for someone else to start one, it had to be me. I look at the glass and say, “Wow, a drink of water!”. I’m always thinking about what is next down the road and tend to allow UFO’s to just be a technique that I have learned rather than something I’m compelled to finish. 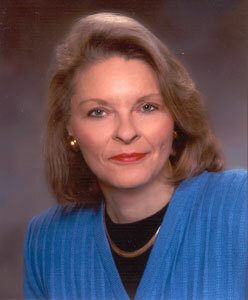 Sherri Dew, the CEO of Deseret Book in Salt Lake City. I’d love to have some of her spirituality and business expertise rub off on me, and to be mentored by her. 14.Anything else you’d like to share? The Book you are currently reading – The Help – in audiobook format. The three voices that tell the story are magical. 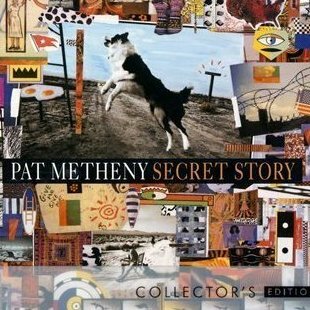 A Song that makes you ‘dance the happy dance’ -Christmas Wrapping by the Waitresses, but my all-time favorite, stranded on a desert island song is “Antonia” by Pat Metheny off of the Secret Story album. It is the ultimate complete story within a song – you can almost see the story play out as you listen. 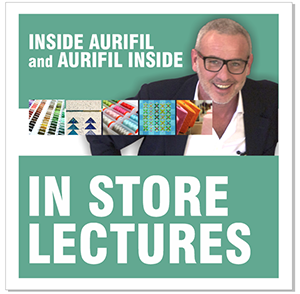 Visit Annie and check out all her podcasts with people in the quilt industry, they are great! Great interview. Love the giveaway pattern. Thanks. Auriful is my favorite thread, just finished a quilt last night using Auriful exclusively! 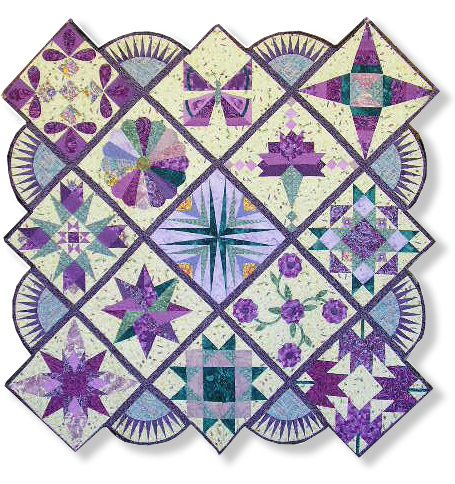 Your purple sampler quilt is stunning! 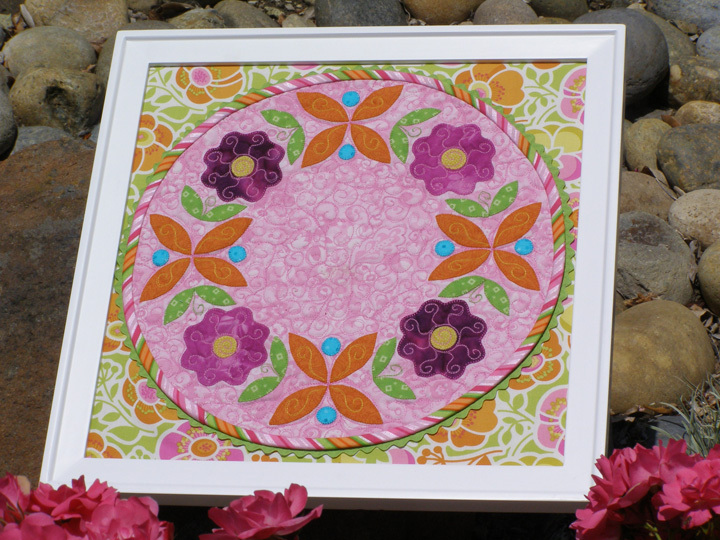 And, I love the idea of framing the Aurifil Block that you did. It looks beautiful too. Great Interview! Love the black album quilt, absolutely stunning!! Annie Smith was the first person that recommended I use 50 wt. Aurifil thread for piecing. I loved it and have used it ever since. I love Annie’s podcasts, her quilts, her warm personality, and Aurifil thread. Great interview! Thank you, Grace! 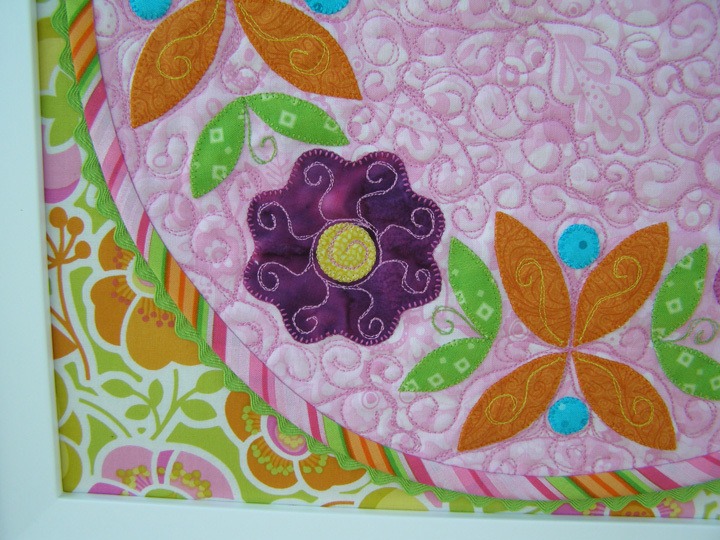 The Purple Sampler is from my online class: Quilter’s Palette. 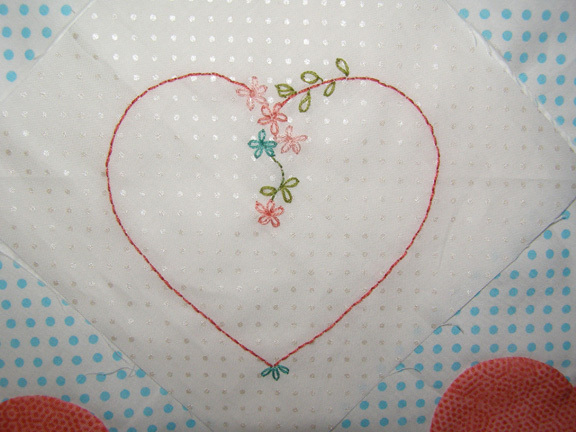 It is a sampler of techniques: three ways to do machine applique, five ways to paper piece, easy y-seams, creating your own block, curved seams and more — all on the machine with no hand sewing or piecing. It’s an eleven lesson class that is self-paced — you work at your own comfortable speed. For complete information, go to simplearts.com. Thank you, Cathy! The black quilt is called West of Baltimore, and if you live anywhere near Long Beach, CA, you can see it at the International Quilt Festival in July. 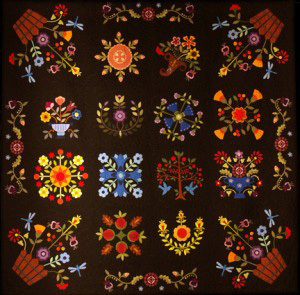 It’s one of the 40 quilts in Elly Sienkiewicz’s New Baltimore Album Revival exhibit. 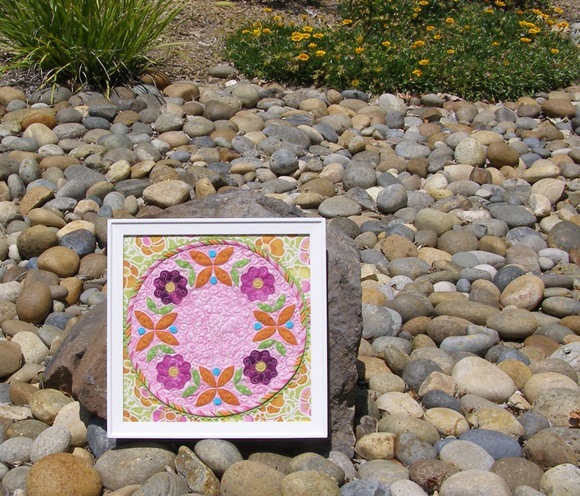 I also carry the patterns for it on my website, simplearts.com, and teach it as an online class, block of the month. I love this pattern and mine is nearly done. I am going to use mine as a table topper. Maybe tomorrow.. Loved your interview and thanks for the pattern. The first quilt I made over 25 yrs ago was a sampler which taught me all different techniques which I use to this day. Recently used Aurifil thread in a project and love it.